Many moons ago I had a hankering to be a freelance photojournalist. I must have been about 17 at the time and was just falling in love with photography. It seemed to me there could be no more enjoyable and satisfying job than being paid to take photographs and working as my own boss. My early successes quickly turned into failures and sort of stopped me in my tracks. I got a two page colour spread in The Automobile magazine of the Glamis Extravaganza, one of the biggest and best classic car shows in the UK. The publisher, dirty swine that he was, not only didn't pay me for it but kept my big beautiful 6x9cm Mamiya Press slides as well! It was about 15 years later that some but not all of the slides were returned to me when a new publisher took over and found them in a filing system. No apology and no payment, however. Then I went over to Knockhill race track in Fife to photograph a stunt driver and various other motoring-related activities and was delighted when the organiser of the show asked for about 80 black and white 10x8s. I stood printing in my mum's kitchen into the wee small hours before parcelling them up the following morning and posting them off. He never paid me either and kept all my prints as well! At the time I wrote it off to experience but it did tend to sour the idea of freelancing for me. Nowadays, I'd drive down to the publisher's office and, paraphrasing Bernie Winters, "smash his face in". I did have a few jobs where I got some cash for my efforts but it was never really that much once travelling and materials expenses were deducted. I shot a fireman's wedding in Fife on - wait for it - 400 ISO Konica 35mm print film. Yes, the prints were very grainy and not too sharp. It was my first wedding and couldn't have been a bigger baptism of fire. It was raining heavily and blowing a gale so I had to shoot the pictures in the church. The church ceiling was so high it was almost out of sight so bounced flash was out of the question. On camera flash, Konica 400 and an OM1 it was then. Fortunately, the fireman seemed happy enough with the prints - either that or he was a good actor. I learned a lot that day! Then there was one occasion when I photographed the rehearsals for a concert in Dundee's Caird Hall and took them along to the offices of The Courier newspaper to see if they'd be interested. They didn't want my prints but did give me a job as a reporter a few months later. And that, more or less, was the death knell for my freelancing ambitions. Truth be told, the job killed off most of my other ambitions as well, such as they were. I'd no real interest in being a reporter but the job wasn't difficult, the pay was OK and it was a comfortable enough position. Now, I think of it as the complete waste of a working life. I always felt I'd more in common with the staff photographers. Whenever I was out on a job, I'd usually end up chatting to the freelance photographers or the staffers from other papers rather than my writing colleagues. Since then I've dabbled a bit with freelancing and even advertising copywriting but not in a serious way. This all came to mind when I unearthed at the weekend a long forgotten folder with Mallinsons School of Photography on the cover. 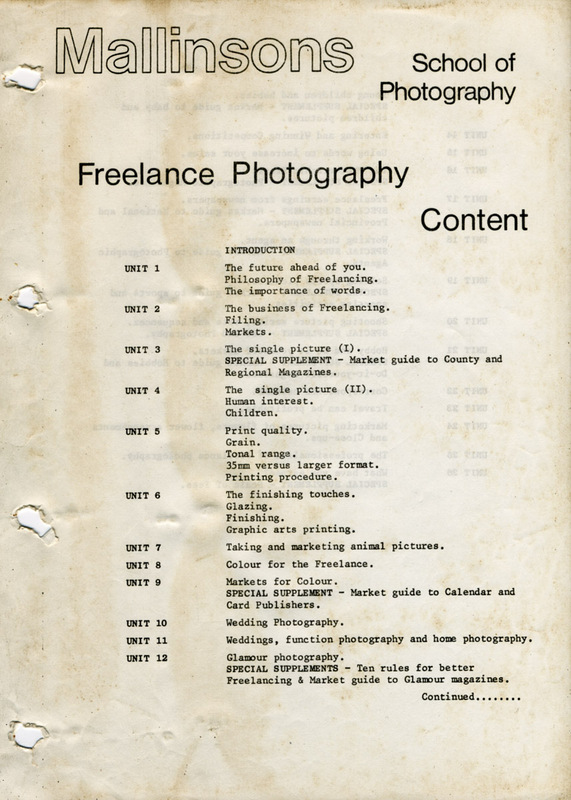 I subscribed to this freelance photography correspondence course for a few months in the early 1980s but never kept it going. The course work, I'm fairly sure, was written by a photographer called Louis Peek. I have one of his freelancing books and the style is just the same. Plus, he signed off his Mallinsons articles with "LFP" and I seem to remember that Louis had a middle name beginning with F.
The idea of Mallinsons, as with most other similar courses, was to give the budding freelance the information he needed to start selling prints. Everything was covered from choosing a format, camera and film stock to printing essentials and on to markets for magazines, newspapers calendar publishers, etc. It was a bit of a journey down memory lane as I sat reading Louis' words again and left me feeling slightly melancholy about the gradual demise of film photography - at least from the heights of the 1980s - which left much of his advice sadly out of date. The first contents page of the Mallinsons course. He was a great advocate of medium format negatives. The basic requirement was to consistently produce sharp, grain free and well-graded 10x8 prints and if you could do that with 35mm then fine. But if you tended to be a bit hit and miss with the smaller format then it was much better to buy a Rolleicord, Minolta Autocord or similar, a good exposure meter, a lens hood and yellow filter. Here's some more of Louis' advice which some readers might find useful or informative. It certainly drives home how much photography has changed. There is no doubt that the skilled and meticulous craftsman can obtain superb results from 35mm film - often indistinguishable from those obtained with larger format cameras. Yet, although all the tutors at Mallinsons use 35mm when the need dictates — the small format negative has considerable disadvantages for the freelance. A major one is, of course, that at the moment, 35mm transparencies are very difficult to market successfully, but even if you used only black and white film, the disadvantages of the 35m camera would still be apparent, and one of the most serious is the problem of dirt and scratches on the negative. As a freelance you are basically planning to build up a library of negatives which will be printed and reprinted many times over during the coming years. Each time the negative is taken out of its file, placed in the enlarger, replaced in the file, etc., it is likely to pick up minute scratches and bits of dirt, and because the negative is enlarged considerably more than a 2in sq or a 2in x 3in negative, every scratch or bit of fluff on the negative is also enlarged that many times greater. These will leave white marks on the print which must be spotted out - the larger the white marks, the longer they will take to spot, and the more difficult it is to match the retouching with the print area. Obviously meticulous cleanliness and care at every stage of processing and printing will minimise such problems, but the fact always remains that the large format negative has, by its very size, considerable advantages - not the least being that, with the larger negative area, it is possible to ‘pull up' small portions of the negative and still obtain top quality prints. 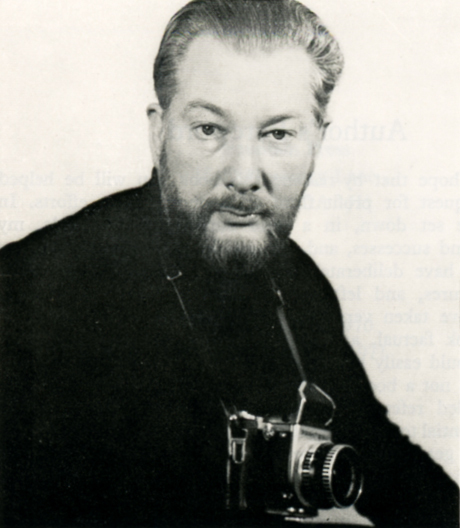 Nevertheless, in terms of versatility, there are few cameras to match the SLR — single lens reflex — for which you can obtain an enormous range of lenses, from the 7.5mm fish-eye to a l000mm mirror lens, and because the 35m SLR is manufactured in such large quantities, prices of lenses and other accessories tend to be lower than for roll film SLR's. 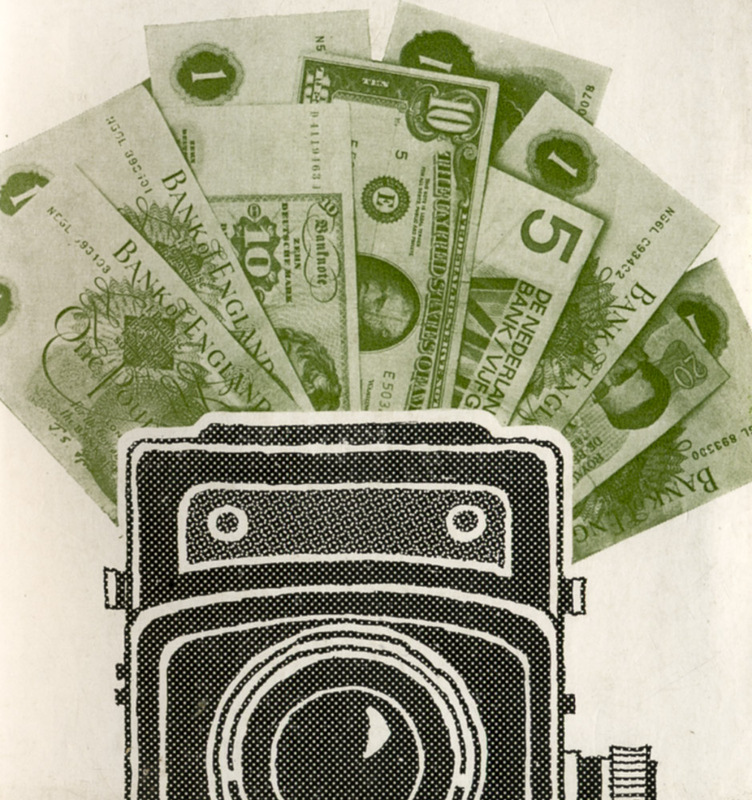 There is little doubt that for the aspiring freelance the best choice of equipment is a camera taking 8 or l2 pictures on 120 film — the l2-on being, by far, the more popular, and the most suitable for black and white. Cameras available for this type of film range from the folding camera (no longer being manufactured, but many superb examples such as the Ensign Selfix are available on the secondhand market, from between £10 and £20), the twin lens reflex such as the Rolleiflex/Cord, Minolta Autocord and Yashicamat etc., and the most luxurious of all cameras — the 2in sq single lens reflex, such as the Hasselblad, Bronica and Pentacon 6. Folding cameras such as the Ensign Selfix and Ensign Autorange, the Voigtlander Bessa and the Zeiss Super lkonta have the advantage of compactness, which is unmatched by any other type of camera using that format film. The more de-luxe models may incorporate a coupled rangefinder, while simpler models will have, either an uncoupled rangefinder, or a simple optical viewfinder. They are, perhaps, not as rapid to use as the other types of cameras, usually the film wind is by a knob and red window, and the shutter must often be separately cocked — rather than being automatically reset when the film is advanced. For this reason they are not as ideal for recording the fast-moving situation as is a twin lens or single lens reflex, but their compactness makes them ideal for landscape and similar type of photography - they take up very little space in the luggage when travelling overseas and can be easily carried in a brief case or even in the car. In trying to figure out the easiest way of getting the text from the Mallinsons page onto this blog, I Googled OCR (optical character recognition) and found a website which converts a scanned jpeg or tiff of the page into editable text there and then - brilliant! Perhaps I should scan the rest of the Mallinsons pages and add them to the blog as a little bit of photographic history. I can't see there being any copyright problems because the company seems to be no longer around and there is hardly any information about it on the internet. I believe Mallinsons used to have a physical school of photography on the Isle of Wight but there's very little out there apart from the odd mention or two. Louis, too, seems to have been largely forgotten which is a shame as he was very good at doing what he did and had a nice, easy writing style that I enjoyed. It is possible he is still living but I reckon he'd have to be in his late 80s by now. Perhaps a reader will know? So that, by and large, was my involvement in freelance photography although I still get the urge to do something along those lines again. In fact, it had been my intention to sell off my Nikon D700 outfit to fund the recent Leica acquisition but I'm having second thoughts. Is there still a chance I'll get the finger out and have another bash? I don't know but I do know that it's impossible now without a good digital camera. And I bet you never thought you'd see me writing anything like that! I dreamed of being a news photographer shortly after my wife gave me my first SLR, an Olympus OM-10, in 1978. Soon I had two bodies and a variety of 2.8 zooms and even faster primes. It would be 20 years before I tried being a fulltime freelancer. I was fortunate to get hooked up with a fledgling weekly newspaper which I supported (and, through their payments, supported me and my wife) for the next decade. When the 2008 recession hit and ad revenues dried up I had to returned to a previous career. But, now that I am retired, I look on that decade of photographing daily, the people I got to know in my coverage area, the 60-70 (or more) hour long weeks as the best working time of my life. I don't want to be a party pooper, but from my position as a pre-press photoshop specialist at a big newspaper, judging by the amount of incoming Iphone files shot by non-photographers that get published without anyone stopping it from happening, I can see no future for news photographers. The only viable scenario for the enthusiast photographer of the artistic kind, must be self publishing, without any dreams of getting rich out of it. 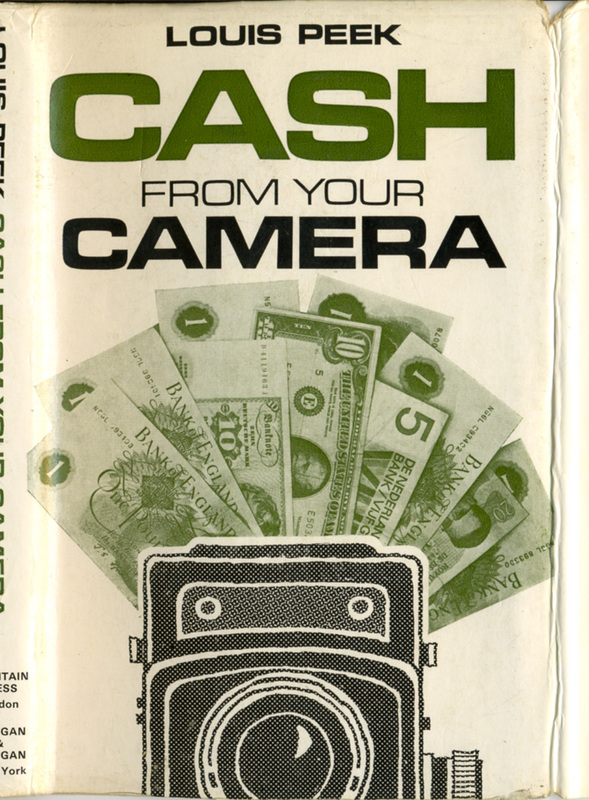 I got "Cash from Your Camera" in the early '70s -- wow! more than 40 years ago -- and still have my copy. It was inspirational for me. I went on to start my own business in 1978 and have not had a "real job" since. My career is winding down these days, but I'm still picking up assignments from time to time and working on book projects. One thing both you and I could do, since we can write as well as photograph, is research ideas and generate photo/story packages and sell them to magazines. We're probably not going to be able to compete with the cell-phonographers for spot news, but our skills at putting together a story in both words and pictures should differentiate us. We won't get rich doing this, but I think it's a viable path for someone who would like to make some money, but doesn't have to actually make a living at it. Yep -I agree with click - I believe it to be dead. However as with all things photographic there are still means of self-expression, but it isn't going to make money. Why spoil the enjoyment of what you do by knowing that your next assignment has to pay the rent/food etc. I wanted to be a printer back in the mid-80's. Short of moving to London, there was no work in Scotland, so I drifted into retail . . and now write and photograph and think more about it than I did then . .
As an aside from this - my sister had a long-term relationship (and two daughters) with David Warner Ellis - just Google-image him. He made a living from rock photography, but it was a hell of a scrape even with some incredibly well-known images which were licensed through Redferns, now Getty. It wasn't an easy life. As for you Bruce - you are writing, photographing and providing a huge amount of entertainment and info to a lot of people - you should be commended. I'm just sorry it isn't making you a living . . . The intention would never be to cover news. That way lies madness. I'm in agreement with Dave that illustrating features would be the way to go. Just sending in stand-alone pics is never going to do it. The difficult bit is coming up with the ideas for the articles. Once you've done that the writing and photography is straightforward enough. Become a freelancer is not an easy job. First, you have to decide that which thing you going to learn. Then you have to learn that very well. Then you have to practice more and more. After practicing more more you will become a good freelancer as my opinion.